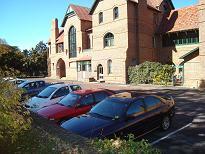 The University of New England established a Restricted Parking Area and Pay Parking Scheme on campus in 2001. Restricted Parking operates 24 hours a day, all year round. Pay parking operates as indicated on the parking signs Monday-Friday excluding weekends & public Holidays. UNE's campuses are open to public access and the Restricted Parking Area and Pay Parking Scheme are not intended to restrict access to the campus. Any person who brings a vehicle onto campus must apply for the appropriate parking permit or parking ticket or abide by the permissive parking signage. Vehicles must display that permit/ ticket in clear view from the outside of the vehicle with all permit details displayed. Parking tickets are available for purchase from any of the ticket machines on campus. The issue of a parking permit entitles a member of the university community to park in a designated and formal car parking space only, to the extent that such space is available. 15 minute, half hour, and two hour bays are available for parking in selected areas around campus. Vehicles are not required to purchase or display a parking permit in timed bays. A vehicle parked in a timed bay must comply with the corresponding signage. Any vehicle that parks in contradiction to signage is deemed to have committed an offense and subject to the issue of a penalty notice. Students and Staff are urged to consider alternatives, such as public transport and car pooling, and greater use of bicycles to take advantage of the cycleways servicing the University. It is in the interests of all members of the University community, and the development and maintenance of the bushland setting of the campus, to reduce the number of private vehicles traveling to the site, as well as assisting with the broader issues of air pollution, traffic congestion and the like. UNE accepts no responsibility for vehicles parked on campus. You park your vehicle at your own risk. Regular patrols of the campus are undertaken by our Safety and Security Officers to ensure that vehicles are properly parked. Revenue NSW processes all Penalty Notices on behalf of the University. Appeals against the issuing of a Penalty Notice are to be directed to the SDRO & not UNE. Appeals can be made on-line via the Revenue NSW web site or by mail addressed to P O Box 786 Strawberry Hills NSW 2012.
other breaches of the UNE Parking Policy & Parking Procedures are committed. If you have any questions relating to Parking on campus, please contact Parking Administration by email at parking@une.edu.au or by phoning Safety & Security on (02) 6773 3485. Available to logged in Staff Only. Below is a link to an interactive map that shows the type & location of all parking bays on the main campus. This includes our Permit bays (Blue, Red, Silver & Green) as well as Timed, Disabled & Loading bays. Please click on UNEMAP to access the launch page. Public users can download the parking brochure with map (PDF, 4047.37 KB).